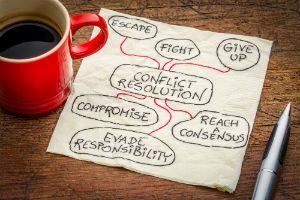 Conflict is one of the most common themes in divorce but it doesn’t need to be. Many families manage to transition from marriage to divorce with little to no conflict, which prevents long-term problems and reduces the impact on the most vulnerable members of the family. Most experts agree that a divorce process riddled with conflict has a significant effect on children after the divorce is complete, more so even than the end of their parents’ marriage or any changes in living arrangements. Why is Conflict So Difficult for Children? One of the reasons conflict during a divorce is so difficult for kids is because they feel pulled between the two people they love and rely on the most in the world. It’s important to remember when you are divorcing, even if your feelings are clouded by anger or resentment, that your children love both you and your former spouse. If you are able to keep this in mind and not allow your own personal bitter feelings to override your child’s feelings, it can help everyone in the family. When parents are at war with one another, especially when the battles involve the custody of the children, it can create distance in their relationships. You might think you are doing what is best for your child but you are actually damaging your relationship with him or her. You are better off allowing your child to take the lead when it comes to his or her relationship with your former spouse unless you believe time spent with your former spouse is a risk to your child’s safety or well-being. If you are concerned your spouse is a threat to your children, make sure you share your thoughts with your attorney. This information can also be helpful. If you believe there is an immediate threat to anyone’s safety you should contact law enforcement. Your kids need you now more than ever during your divorce, so it’s important to manage your feelings as much as possible and provide the support and companionship necessary to help your child through this transition. Not only do these factors affect the child’s relationship with both parents, but they also affect a child’s ability to relate to their world around them. When children see parents working together to resolve conflict as respectfully and peacefully as possible, it enables them to carry these skills into other areas of their own lives. Resolving conflict as quickly as possible also helps children adjust to the idea of being in a divorced family, instead of holding onto the hope that their parents will reconcile. When they see their parents working as a team, even if it’s an unmarried team, they understand this new paradigm works better than the old married way of doing things. If you and your spouse have decided to end your marriage or divorce proceedings have begun and you’re eager to separate with as little conflict as possible, we can help. Contact Gourvitz & Gourvitz, LLC at (973) 467-3200 or (212) 586-1700 to discuss how you can make your divorce as easy as possible for your children.